It is about a girl called Velvet and she has a little brother called Donald and 3 sisters called Edwina, Merideth and Malvolia. When a guy that Velvet knows dies in front of her own eyes, the man gives her his six horses, which Velvet and her sisters love to ride. So they enter the Gymkhana and when Velvet wins a race against the adults there she is delighted. When she gets home she and her sisters enter the village raffle, the first prize of the raffle is a beautiful piebald horse. Velvet wins the horse and speaks to a very close family friend about helping her enter the grand national on the piebald, he helps her and to their surprise she wins but back in those days girls weren't allowed to be jockeys. Velvet and Mi get caught out and nearly get charged for fraud, but she gets let off. Velvet is a very lucky girl that loves horses and now thanks to her best friend Mi is now famous too. But she didn't enter the Grand National so she can become famous. She does it for her horse, "The Pie" as he's known, so he is put down in history. 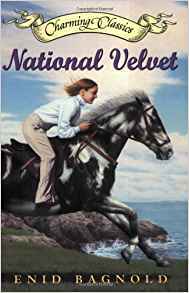 That is how she became National Velvet!! It was ok, I did not like the strong swearing. I like this book but I wasn't crazy about it. It was a bit confusing and had really old difficult language I didn't understand. It's cute though. I like that velvet has paper horses and loves them. Hey I've heard good things! I think I may give it a go! It was the end of the year and my school library was giving away books... i got so lucky because they were giving it away! This book was a little confusing and a bit boring. I don't like how she gets so many horses. (if i tell it will give it away for other readers.) I have read many horse books....but this one wasn't as good. wow this is a great book! dont miss it! I love this book! I watched the movie first (like I always do) and fell in love. The main character behaves in the same embarrassing manner in her imagination as any horse loving little girl would. And not only does her wish come true, she takes it to a whole new level. I can't say too much without giving it away, but you just have to read this book! It sounds like a great book. I am going to ask my dad to buy it!